I’ve always admired Rembrandt’s wonderful mastery of colour and the shine on metal, and The Night Watch is perhaps his most famous painting. The Night Watch is a group portrait of a militia company led by Captain Frans Banning Cocq and his lieutenant, Willem van Ruytenburgh, surrounded by sixteen of their men. Eighteen of the people in the portrait paid to be included, the others were added by Rembrandt to enhance the composition. It is no coincidence that Rembrandt bought an expensive house at precisely this time. Amsterdam is so proud of this work that it has spawned a number of tribute artworks, including a wonderful large-scale flashmob recreation of Rembrandt’s famous painting. The stunt was organised to coincide with the return of the painting, to Amsterdam’s Rijksmuseum on April 13, 2013 after a decade-long renovation project. At Amsterdam’s Rembrandtplein, beneath a statue of the artist, there is a bronze-cast of ‘The Night Watch’, that was created in 2006 as part of the celebration of the artist’s 400th birthday. For three years, this bronze-cast representation of the famous painting was on display before traveling to New York City, Moscow and Oranienbaum, Russia. The bronze Nightwatch sculptures returned to the redesigned square in 2012, where they are a magnet for visitors. 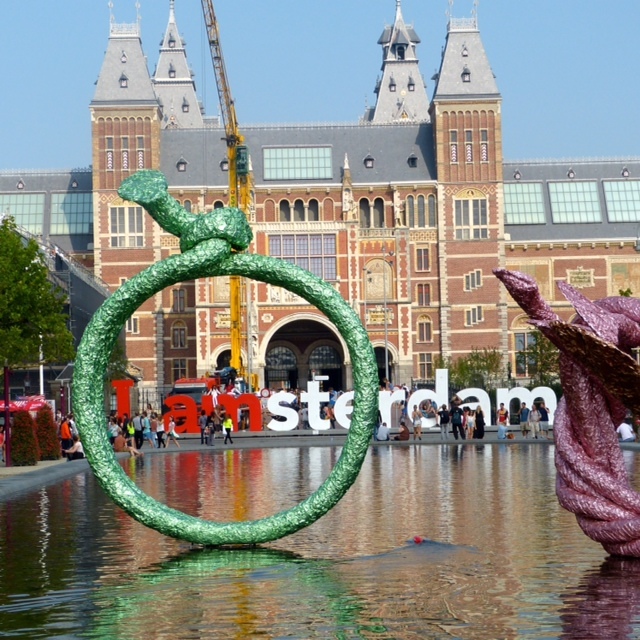 The Rembrandtplein Entrepreneurs Foundation began a fundraiser in 2013 to keep the sculptures in the square throughout the year. You can also read more about Amsterdam on Tracey’s post 365 Places: Amsterdam. The sculptures are most impressive.